Apple, Adobe, Facebook, Google, HP, Microsoft, Mozilla, Nokia, and Opera have joined the W3C to launch a new website called ‘Web Platform‘ which will serve a a single source of relevant, up-to-date and quality information on the latest HTML5, CSS3, and other Web standards, offering tips on web development and best practises for the technologies. The site right now has a wiki, docs.webplatform.org, which anyone with an account can edit, and structured templates for ensuring consistency. It has a massive import of data from Microsoft, Opera, Google, Facebook, Mozilla, Nokia, Adobe, and W3C, still in a rough form, that needs a lot of polishing. It has a chat channel and Q&A forums, and a blog. And all this material will be available free, for anyone to use for any purpose. 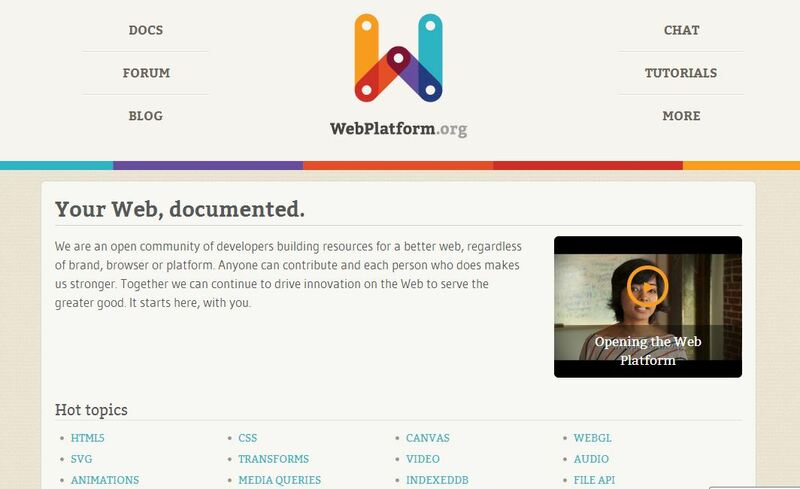 WebPlatform.org will have accurate, up-to-date, comprehensive references and tutorials for every part of client-side development and design, with quirks and bugs revealed and explained. It will have in-depth indicators of browser support and interoperability, with links to tests for specific features. It will feature discussions and script libraries for cutting-edge features at various states of implementation or standardization, with the opportunity to give feedback into the process before the features are locked down. It will have features to let you experiment with and share code snippets, examples, and solutions. It will have an API to access the structured information for easy reuse. It will have resources for teachers to help them train their students with critical skills. It will have information you just can’t get anywhere else, and it will have it all in one place.